Mitsubishi Tanabe Pharma Historical Museum is divided into three zones: Doshomachi District Zone, showcasing the company’s history and culture and histories of the area where Japanese pharmaceutical business originated; the History Zone, featuring a variety of materials and items collected over three centuries; and the Present and Future Zone, focusing on the company's current and future-progressive efforts toward pharmaceutical discovery, post-marketing development , and delivery on an international stage. 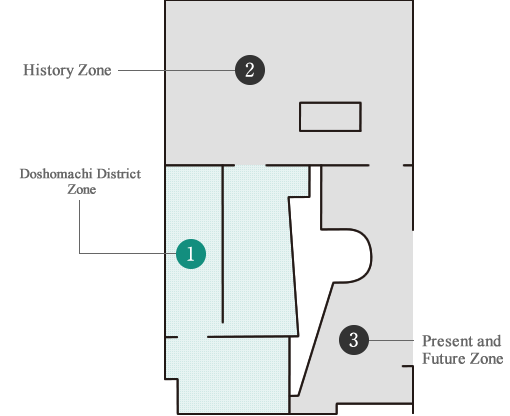 This Zone recreates Doshomachi District at the start of the Meiji Period, along with the appearance of the Tanabeya store. 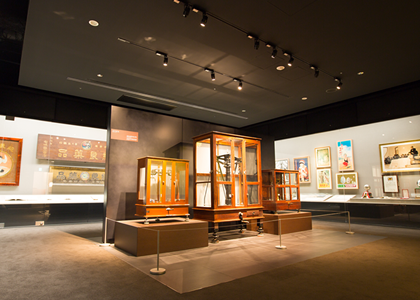 Visitors will see the lantern placed under the eaves and signs from the era, accompanied by a video of Tanabe Gohei the 12th speaking about the company's roots. This Zone presents our historical activities, along with collected items from that history. 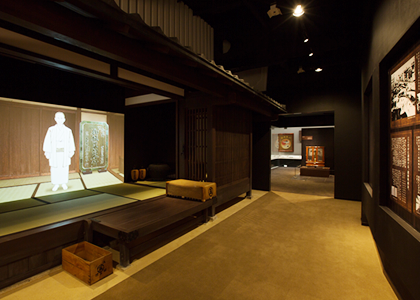 At the end of the Zone, a video offers an overview of our history from the Taisho Period to today, leading visitors to the next Zone: the Present and Future Zone. Covering research & development (R&D), post-marketing development, and the close relationship between the body and medicine, this Zone reveals the present and future of Mitsubishi Tanabe Pharma on its journey of over 300 years as a global research-driven pharmaceutical company. Addition to the above, you may learn about effects or action of medicines through 3D video projection mapping and enjoy quizzes and puzzles related to medicines and human bodies. © 2015 Mitsubishi Tanabe Pharma Corporation.